Services - Terraquest Environmental Consultants, P.C. Terraquest Environmental Consultants, P.C. 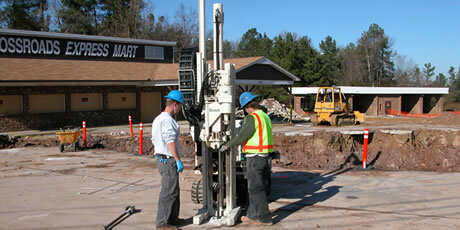 offers a broad range of environmental services including assessment, remediation, and drilling. During the assessment phase, information is collected about the site from a variety of sources such as field investigations, regulatory records, and literature searches. Samples collected during the assessment phase may consist of air, water, soil, or other solid samples. Drilling is often used to collect the samples by installing monitoring points using our Geoprobe 7822DT direct push / auger rig. Data collected during the assessment phase is used to determine an appropriate means of remediation, if required. For additional information regarding our services, please click on the appropriate link. Our goal is to be your source for environmental solutions.